The IMF does not pull any punches in its latest post on the IMF blog. It is really worried that so-called ‘leveraged loans’ are reaching dangerous levels globally. These loans, usually arranged by a syndicate of banks, are made to companies that are heavily indebted or have weak credit ratings. They are called “leveraged” because the ratio of the borrower’s debt to assets or earnings significantly exceeds industry norms. The level of these loans globally now stands at $1.3trn and annual issuance is now matching the pre-crash year of 2007. “With interest rates extremely low for years and with ample money flowing though the financial system, yield-hungry investors are tolerating ever-higher levels of risk and betting on financial instruments that, in less speculative times, they might sensibly shun.” says the IMF. About 70% of these loans are in the US; so that is where the risk of a credit crunch is greatest. And more than half of this year’s total involves money borrowed to fund mergers and acquisitions and leveraged buyouts (LBOs), pay dividends, and buy back shares from investor—in other words, for financial risk-taking rather than productive investment. 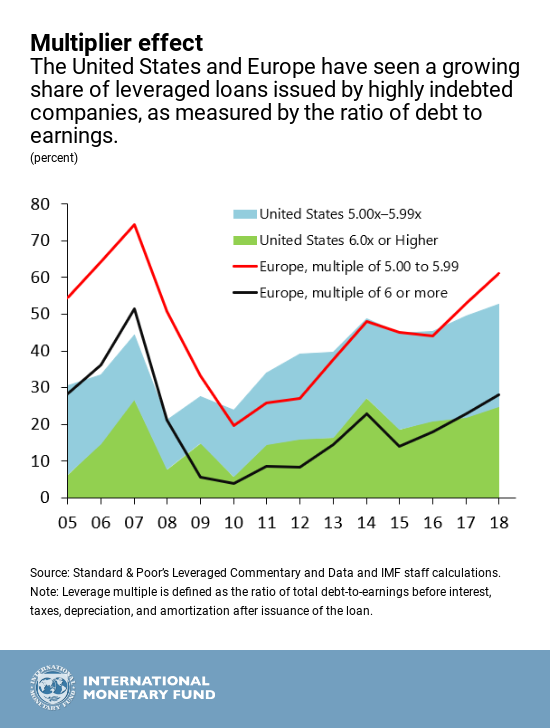 And even though corporate earnings in the US have risen sharply in 2018, the share of companies that have raised their debt to earnings above five times has reached a higher level than in 2007. New deals also include fewer investor protections, known as covenants, and lower loss-absorption capacity. 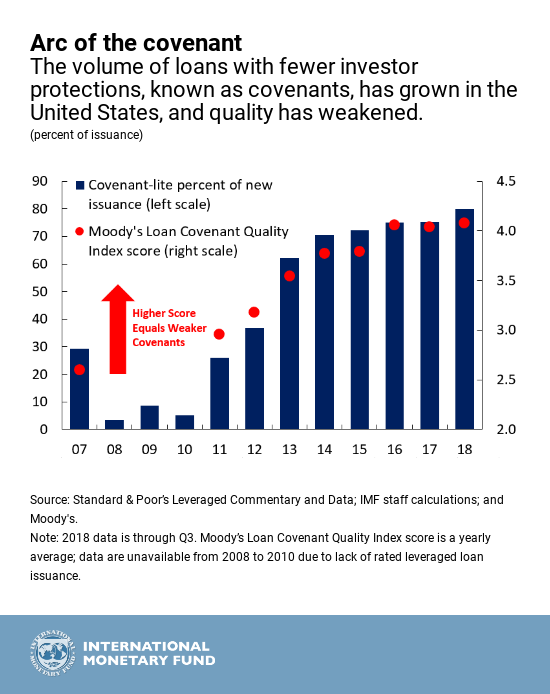 This year, so-called covenant-lite loans account for up 80% of new loans arranged for non-bank lenders (so-called “institutional investors”), up from about 30% in 2007. With rising leverage, weakening investor protections and eroding debt cushions, average recovery rates for defaulted loans have fallen to 69% from the pre-crisis average of 82%. So any sizeable defaults would hit the ‘real’ economy hard. Back in 2007, the debt crunch was exacerbated by the phenomenal growth in credit derivatives issued by non-banks, the so-called ‘shadow banks’, not subject to central bank controls. Now again, it is in the shadow bank area that a debt crisis is looming. 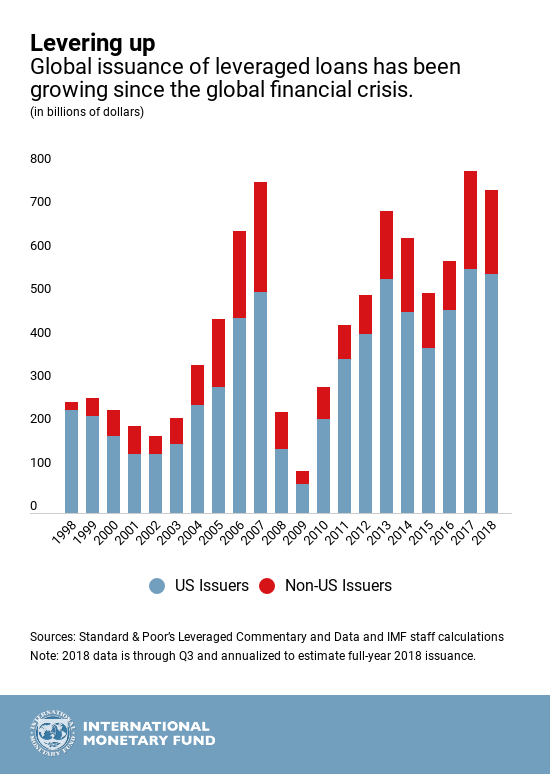 These institutions now hold about $1.1 trillion of leveraged loans in the US, almost double the pre-crisis level. On top of that are $1.2 trillion in high yield, or junk bonds, outstanding. The non-bank institutions include loan mutual funds, insurance companies, pension funds, and collateralized loan obligations (CLOs), which package loans and then resell them to still other investors. 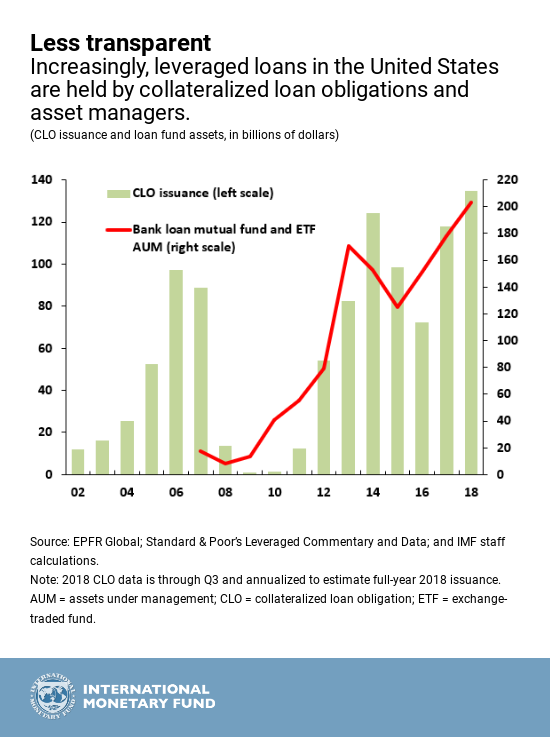 CLOs buy more than half of overall leveraged loan issuance. Mutual funds (which are usually bought by average savers through their banks) that invest in leveraged loans have grown from roughly $20 billion in assets in 2006 to about $200 billion this year, accounting for over 20% of loans outstanding. All this debt can be serviced as long as earnings pour into companies and the interest rate on the debt does not rise too much. Corporate earnings appear to be strong at least in the US. In the latest quarter of reported company earnings, with 85-90% of companies having reported, US corporate earnings are up nearly 27% from the same period last year (although sales revenues are up only 8%). 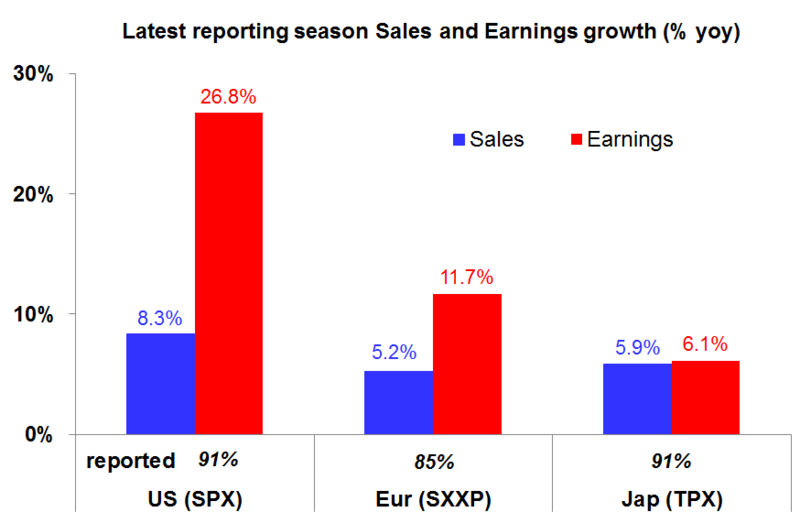 US sales revenue growth is about 20% higher than in Europe and Japan but earnings growth is two to three times larger. That tells you US earnings are being inflated by the one-off Trump corporate tax cuts etc. The other moving part is the cost of borrowing. The decade of low interest rates is over as the US Fed continues with its policy of hiking its policy rate. This entry was posted on November 16, 2018 at 3:19 pm and is filed under capitalism, economics, Profitability. You can follow any responses to this entry through the RSS 2.0 feed. You can leave a response, or trackback from your own site. Two interesting comments in the media today. Cramer, CNBC’s big mouth has said that during the private conversations he has had with CEO of large US corporations they have revealed their surprise even alarm at how quickly the US economy is slowing down. Secondly, over the last two days the FT has reported the concerns of veteran investors over the size and fragility of US Corporate Debt amounting to a reported $9 trillion. As fear starts to replace greed will the FED backpedal and will Trump damp the trade war???? Nice article. My only quibble is with the last paragraph, which claims Fed interest rate rises might spark off a slump. Strikes me that if that looked like being the case, the Fed would CUT those interest rates. What makes up the EU can easily be learned from the draft Brexit draft. Those who find this bureaucratic effort exaggerated should be reminded that every single EU country in the past has had to impose this bureaucratic burden on itself and its national borders. The common market of the EU eliminated these public expenditures for the individual member states. They only share the costs of the common border regime at the external borders of the EU. But the Brexitiers want to “regain control” over “their” borders. Amazingly the accuracy of this article and the stock market dropping almost breaking the trend and if that happen we might be in direction of a bear market or recession. Soon the Fed will review its police in order to cut rates.